Managed.com Review 2019: Is Managed.com a Good Hosting? I signed up to Managed.com, reviewed their unique features, tested how easy they are to use, checked with support on several issues, and tested the speed of the live site. When done, I tried to cancel my account and receive a refund. This is my experience with Managed.com - I hope you can learn from it. Managed.com is based in Nebraska, U.S., in an area nicknamed the Silicon Prairies due to the high number of tech companies in the area. It owns multiple data centers around the world and has customers in more than 110 countries. The website is provided in English. Managed.com has a network of data centers around the world: three in North America, one in the U.K., one in Europe, and on in Australia. The company commits to 99.999% available data center uptime, however, there’s no guarantee or SLA. There are three Linux and three Windows shared hosting plans. I’d like to tell you about both but the link to the Linux plan does not work and I couldn’t get any confirmation from customer service about the inclusions. So, I’ll dive in to the Windows plans. The plans are all managed, which means backup protection is included and its team will work with you to build a Disaster Recovery Strategy and custom solutions such as off-site duplication of your data. The plans include support engineers on-staff to help with problems with your CMS, for example, WordPress, Drupal, Joomla!, or e-commerce options like nopCommerce and Kentico. It’s not clear exactly how the engineers will help you, other than “offering solutions”. While the link to the “Inclusions” was also broken, I can tell you that available features and optional upgrades include module and theme installs, migrations, SSL installations, website monitoring, and so on. The plans are expensive, however, you can expect to pay a premium for a managed hosting service. There’s a few add-ons to take into account as well, from site migrations and CMS upgrades to website restore and SSL assist, all of which have an added one-off cost. The plans come with unlimited FTP accounts and unlimited bandwidth, however, you can only host one, two, or four domains, dependent upon the plan. Aside from the resource allocations, which aren’t bad, It’s hard to tell if the plans are good value for money as the information on the website is quite limited and there’s a lot of broken links. You can email or call (a North American, European, or Australian number) the sales department or create a ticket for technical support. 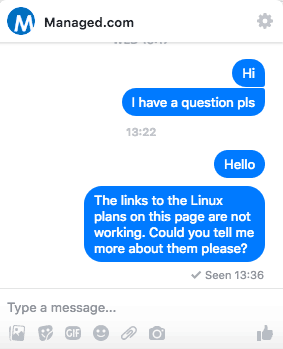 There are also a few social media channels which are active, however, frustratingly I did not receive a reply to my Facebook messages, despite waiting several days seeing that they were read by the company. I also sent an email and did not receive a reply. Unfortunately, my experience is far from the statistics on the website: 15 seconds to answer a call and 30 minutes to respond to a ticket. In the event you have the same customer service experience I did, you can refer to the large knowledge base on the website. Managed.com is a family of internet brands including PowerDNN, a hosting provider, and AppZone, a bare metal hosting provider specifically for apps. While there are gaps in the information on its website and I’ve had a less than optimum experience with customer service, if you’re looking for a global managed host with a long track record, the plans include a good level of resources and expert assistance. Wondering how Managed.com stacks up against other Web Hosting companies? Enter any other Web Hosting company and we will give you a side-by-side comparison.